It will surprise a lot of entrepreneurs to learn that building an e-commerce business with $10 million to $20 million in revenues is not that hard. It also surprises many to learn that it's not actually that valuable. This is in stark contrast to, say, a SaaS business, which is very difficult to build to that level but valuable when you do. As I read this week's board deck for one of our portfolio companies, JustFab, I was struck by one of the reasons this discrepancy exists: marketing leverage. Most retail businesses (traditional or online) have to spend marketing money to acquire a new customer at scale. Small e-commerce companies can be exempt from that – if you fill a niche and you have distinctive product-market fit with a set of customers, you can and should land them virally or cheaply. But as the business grows, you need channels of acquisition that you control beyond sitting around and hoping your customers tell their friends. Customer acquisition costs money and this is where things get tricky in retail. What is the lifetime value of a retail customer? It’s a non-trivial question. In SaaS, for example, this far more predictable due to the subscription model. 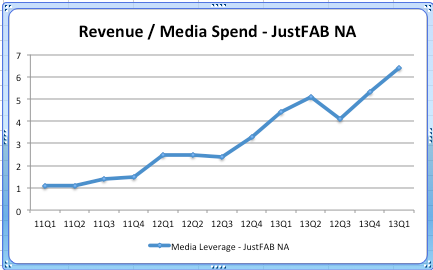 For a concrete example, take the above chart which shows JustFab's North American business. (I redacted the exact numbers, but it's at large scale.) 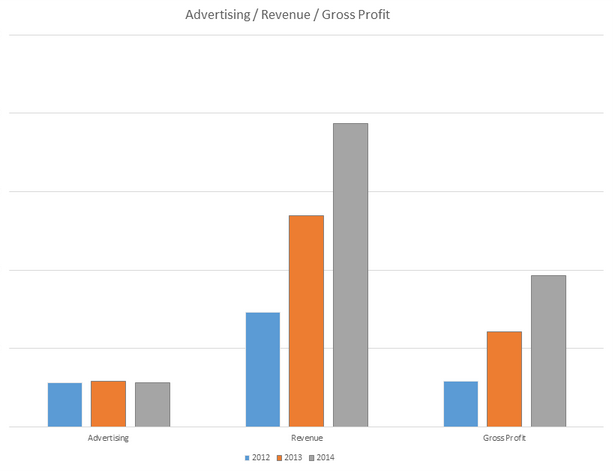 As you see, the company has been able to nearly double revenues year-over-year, on virtually the same advertising spending as the previous year – in fact, advertising has been flat for three years. This isn’t some magical outcome based on large-scale viral adoption. Rather, it’s just good marketing execution to land new customers who like the product coupled with a model that gets them back on the site an average of 30 times a year, providing repeated opportunities to sell to them. Given that a customer who sticks for the first couple months has an expected length of membership of several years, that's a lot of selling opportunities. Re-engagement is the key. This is important because the sneaky problem with e-commerce is paying to reacquire your existing customers. As an investor, I see a lot of companies with a killer product who have built $10 million in revenues at a rapid clip. (Understandably, most burn some cash to get there, but if companies didn't burn cash to build, I'd be out of a job.) In almost all cases, these businesses have an "at-scale economics" slide in their pitch deck that shows a customer will be quite profitable in time – buying from them several times a year, and thus justifying the $42 spent to acquire them as something that will be easily amortized across future purchases. Re-engagement drives higher LTVs, which enable the ability to spend more on acquisition. Unless you're Amazon, the capital markets won't let you grow and burn cash forever. As these companies grow, however, they find they continue to burn cash at an unsustainable rate. One big contributor is the lack of marketing leverage: that customer you acquired for $42, you have to pay $20 again getting him back. Maybe he typed your site name in Google and clicked on the paid link at the top to navigate there, or after ignoring your emails, he finally clicked through on your 40% off coupon. Either way, now that customer cost $62 to acquire. Zulily is the darling of the e-commerce world (and Wall Street) right now, and rightly so – it's a great product, and it's on a growth tear with very reasonable capital consumption. In time, it will have to demonstrate meaningful earnings, and to do so, I believe, it will need marketing leverage. From 2012 to 2013, Zulily grew revenue nearly 110 percent – an awesome rate – reaching an impressive $696 million last year. Marketing spend was up just 62 percent, after an 85 percent increase the year before. The company is certainly demonstrating some marketing leverage while still showing phenomenal growth – hence a breakout e-commerce story. Much more common is a fate like Overstock.com. It grew revenues 18 percent last year (to $1.3 billion) – about the rate of overall e-commerce growth – but to do that, it spent 46 percent more on marketing than the year before. The result, excluding a one-time tax gain, is $16 million in profit (roughly 1 percent margin). That's a lot of work to sell stuff for a buck that costs you 99 cents, and hence a market cap of 0.4-times-sales, compared to Zulily’s seven-times ratio. There is a perception in some quarters that flash sale and subscription businesses have failed as a category. I think a lot of this has to do with high profile companies that didn’t live up to the expectations they set both in their promotion and in the amount of money they raised. While a full teardown of the operational challenges posed by a rapidly growing e-commerce company is worthy of an entirely separate discussion of its own, it is true that the degree of difficulty of scaling these businesses is much, much higher than that of most mobile, social, or SaaS startups. There was a period of easy access to late stage capital (2009-2011), where I believe investors were seduced by the large revenue numbers these startups generated, and all that capital allowed undisciplined management teams to dig themselves very deep holes with mediocre operations. Thus the pendulum swung, and investors who were once “all-in” on e-commerce were now all out – rather than a more nuanced realization that there are some great companies and some poor ones. With Zulily now public and on a staggering trajectory, and other companies like JustFab, Gilt, and One King’s Lane all clearly delivering great results at large scale, it’s clear that the best of these companies are quite good. As we see several more go public over the next year, it would not surprise me to see the pendulum swing back, and the category begin to get over-invested again. Subscription: Long popular in low-COGS business (media such as Netflix or Spotify, SaaS software, information services like Care.com or PeopleSmart), e-commerce is just starting to catch on to this approach. JustFab and BirchBox are probably the biggest examples to date, but others like Dollar Shave Club are knocking on the door. Flash Sales: Gilt (a Matrix company) pioneered this category and continues to make it work. Zulily also uses this as a primary means or driving re-engagement. One King's Lane is another great example in the home category, and there are countless others. The key here is to make daily content an exciting event – unlike subscription, you only have permission to be in the inbox, not a commitment to come to the site – so you have to earn them back every day. Without great content or unbeatable deals this does not happen. Also scarcity is key. Consumers must feel that they better click through that email RIGHT NOW because if you wait an hour, the best things may be gone. If you are going to use "unbeatable deals" as a vector, you'd better have a compelling reason to believe you (as a startup) will have a structural pricing advantage that can't be matched by other larger scale retailers. Loyalty Programs: Amazon Prime is effectively a loyalty program that gives benefits back to the consumer in exchange for concentrating their purchases. A Costco membership is a premier offline example with a similar model: "Pay us $50 per year and we'll sell you everything at cost." The question is, what benefit can you provide your customers that re-engages but doesn't just cost you the same as re-marketing to existing customers? Amazon would argue "it’s better to give that money to the customer than Google," and that's true. But, remember, you are not Jeff Bezos and the market won't let you lose money forever. I think this is an area where there is still room for innovation. Without a structural re-engagement mechanism, you are banking on having such an amazing product (or value) that the customer comes back over and over. It does happen – look at LVMH offline – but it doesn't happen often, and usually not at the pace necessary for a tech startup. I'd rather run a business where you have your hands on the levers of growth than betting on a merchandiser who can anticipate trends and always be at the forefront – though having both would be really nice.